HMS Dreadnought was the first dreadnought battleship, a classification to which she gave her name, and was born out of the minds of Vittorio Cuniberti and First Sea Lord Admiral Sir John Fisher and the results of the Russo-Japanese War. She was the first to use steam turbines, of which Dreadnought had two, from the Parsons company, that supplied four shafts that all told gave the 527-foot (161 m) long warship a revolutionary top speed of 21.6 knots (40.0 km/h; 24.9 mph) in spite of her displacement of 18,120 long tons (18,410 t). Dreadnought’s primary armament was a suite of ten 45-calibre Mk X 12-inch (300 mm) guns, arranged in such a way that only eight of her main guns could fire a broadside, and a secondary armament of ten 50-calibre 12-pounder guns and five 18-inch (460 mm) torpedo tubes. Her belt armour ranged from 4 inches (102 mm) to 11 inches (279 mm) of Krupp armour. Dreadnought sparked a naval arms race that soon had all the world’s major powers building new and bigger warships in her image. Although her concepts would be improved upon for decades, Dreadnought’s construction set an unbeaten record of 15 months for the fastest construction of a battleship ever. 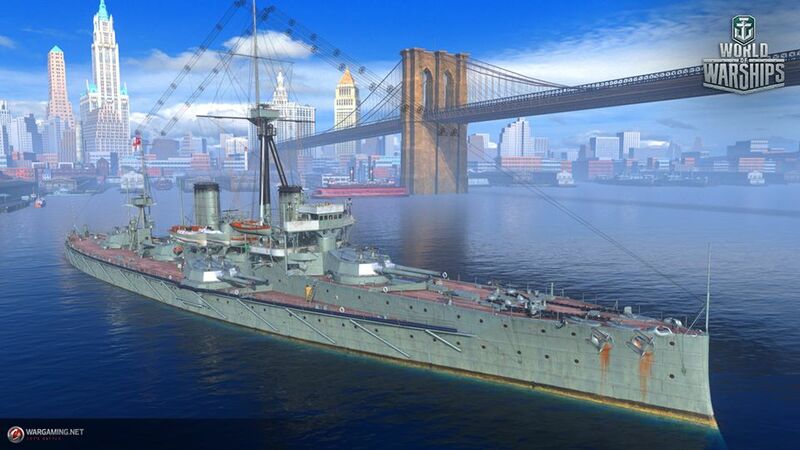 HMS Dreadnought will be a Tier III Premium battleship that soon will enter Supertest stage. More details as soon as they are available. What took them so long? Its the mother of all modern battleships!